When it’s hot outside, lemon is refreshing, and spicy foods actually help your body cool down (that’s why they’re so popular in hot climates like Mexico). Give this salad a try! Put olive oil, lemon juice, crushed garlic clove, and kosher salt (to taste) into a jar and shake it (or a bowl and whisk it) until well mixed. Set aside. 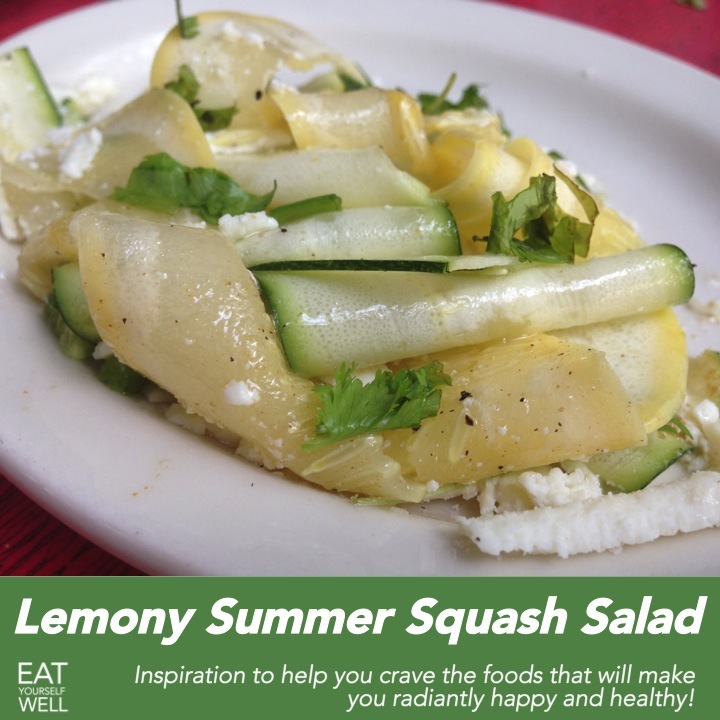 Trim the ends off summer squash. Using a vegetable peeler or mandoline, thinly slice the squash lengthwise into strips and transfer to your serving bowl. Top with minced pepper. Pour dressing over vegetables. Toss, and let stand for about 5-10 minutes, toss again, then sprinkle with the cheese if using. Season with more salt if needed, and freshly ground black pepper, and serve. Note: This is also extra-tasty over a bed of peppery arugula … delicious! Peaches are naturally juicy and sweet … so they need very little added to them to be amazing! Take this basic recipe and experiment all Summer – try adding a handful of raspberries … basil … even some grated ginger! 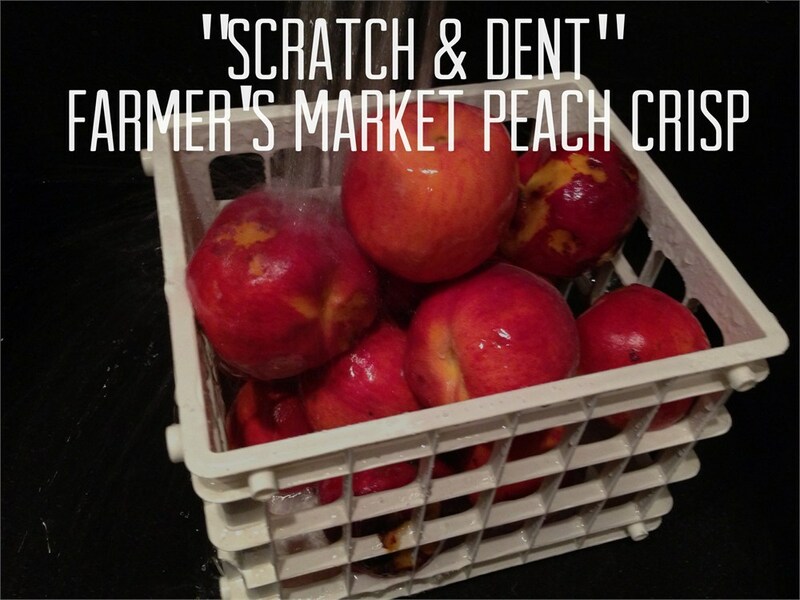 Buy organic peaches for your health and the health of our planet … and ask the growers at your farmer’s market whether they have any “scratch and dent” peaches with bruises or other imperfections. Not only are they a fraction of the price of perfect peaches, they’ll be the fruits that are ripe and ready to use when you get home! 1. Heat oven to 375 degrees. 3. Combine the peach slices with the lemon juice, coconut flour, and almond extract in a large bowl. Toss until the peaches are well coated. 4. Put the peaches into a casserole dish or lasagna pan. 5. Add the the oats, almonds, walnuts, and coconut flakes in a processor and pulse to break up into a coarse but fairly even mixture. Be careful here, don’t over-mix or you’ll wind up with nut butter! 6. Put this mix in your bowl, add the coconut oil, brown sugar, and salt, and mix with a spoon. 7. Place this mixture over the peaches. 8. 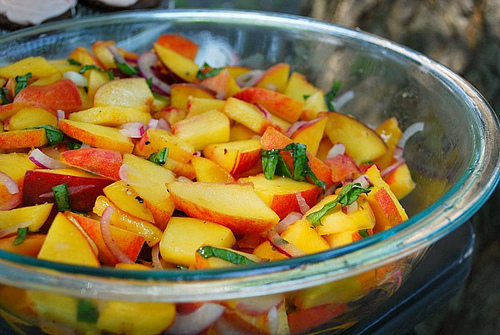 Bake for 35-45 minutes, or until the peaches are bubbling and the topping is lightly browned. Top with greek yogurt or a small scoop of high-quality vanilla ice cream. Most important: sit and really ENJOY the amazing taste of summer … preferably sharing with family and friends who share your love of healthy, delicious food! 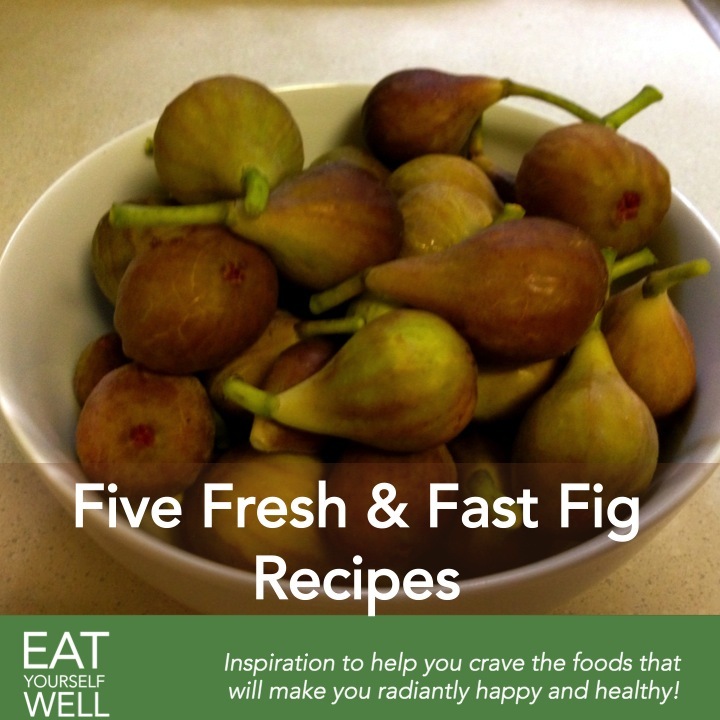 Last week, my figs were tiny and green – this week, they’re ripe – ALL of them! Following are a few ways I’m going to make use of these amazing fruits – in addition to eating them right off the tree, when the birds don’t get to them first! Crispy Broiled Figs: Melt a bit of coconut oil with honey (just a little of each). Lay figs halves on a baking sheet. Brush with melted mix. Broil until the fig tops bubble and start to brown on the edges. Serve as a side dish with veggies, or add a bit of marscapone for a wonderful earthy dessert. Cheesy, Melty Figs: Chop the top half off the fig (reserve for Bruschetta, above :-)) and slightly “open” the bottom half. Add a soft cheese: a nice ripe bleu, robiola, or a bit of brie. Place under broiler until cheese is melted, serve immediately, alone or over mixed greens as a salad. Fig, Walnut, and Goat Cheese Salad: Cut/crumble all into pieces and toss with mixed greens. Top with a quick mix of balsamic vinegar, dijon mustard, and the best olive oil you can find. Gingered Fig Martinis (over 21 only): Blend 2 cups figs, 1 small knob of ginger (less for less spicy, more for more) 2 tsp water and the juice of 1/2 to 1 lemon (depending on size) in the blender. Pour over ice in cocktail shaker, add vodka to taste and shake well. Pour into chilled martini glass. From Jennifer Silverberg at www.EatYourselfWell.com and facebook.com/eatyourselfwell Please maintain link as you copy and share recipe with others! 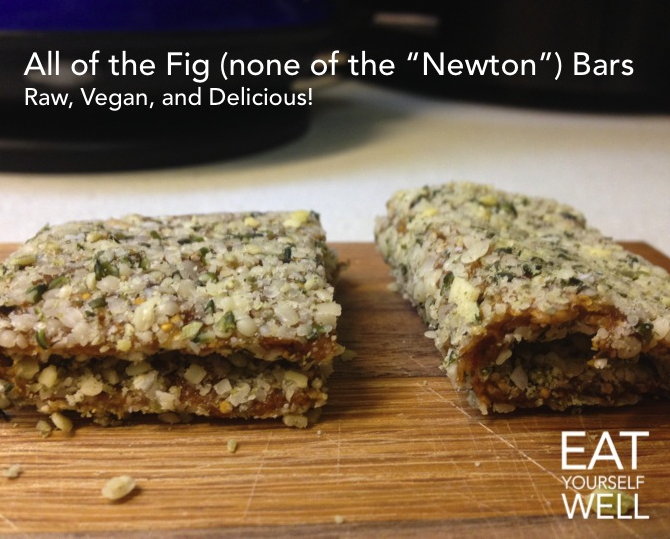 All of the Fig – None of the Newton – Bars! Sometimes you – or your kids – want something sweet, which can wind up being a mess for your healthy, whole-food diet. 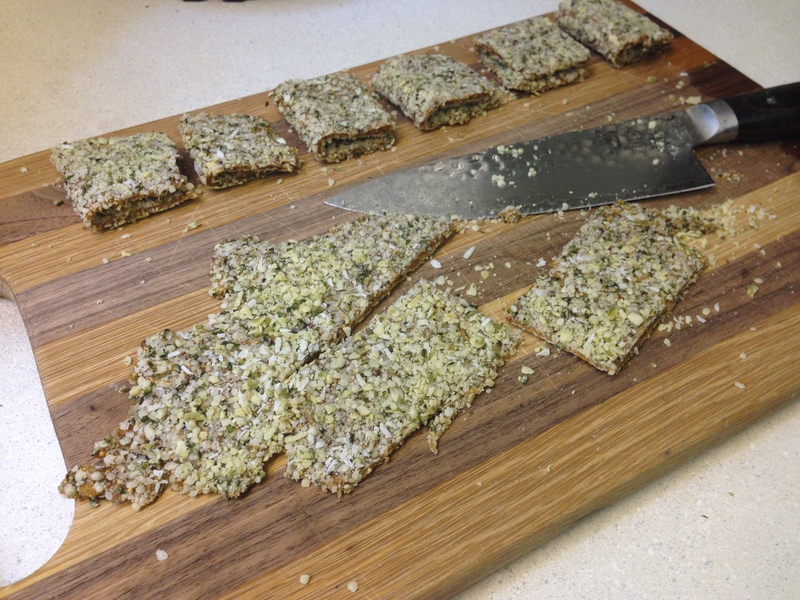 Recently, Food Babe posted about one sandwich bar that we used to think was healthy, but has a dizzying (sometimes literally) array of unnecessary chemicals in the ingredients. That inspired me to grab the simple fig paste I’d made yesterday out of the fridge and try an easy, healthy, replacement for my less-healthy childhood treat. It turned out to be even easier than I’d thought – check this out! Cut the figs into smallish pieces and process by pulsing in a strong food processor. If you do not cut them up into bits, they will gum up in your processor, and possibly burn out the motor – trust me on this one :-). Once the processor is running easily, leave it in the “on” position until the fig bits gather into a ball, about 1 minute. Take about 1 cup of the fig paste on put on a large plastic cutting board or silicone baking mat. Press with your hands or a rolling pin into a disk about 1/4 inch thin. Sprinkle a mix of the hemp seed and pumpkin seeds over the disk and press in with your hands. Flip the disk and repeat. Do this a few more times until the figs are holding as much of the seed as they can. Start cutting the disk into rectangular strips that when folded over (see pic) form a sandwich bar square. Store in fridge, if they aren’t all grabbed up right then! This is a great way to start the day when you wake up with a few aches and pains. 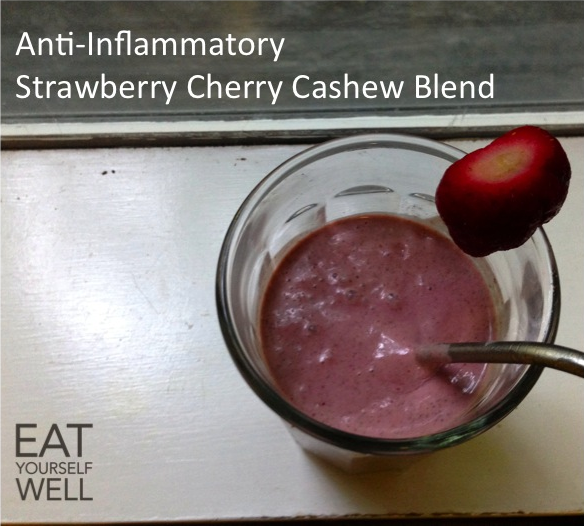 Or, even better – this is a great breakfast to have a few times a week to ward off getting aches and pains at all! Cherries are well-known anti-inflammatory powerhouses due to their high antioxidant – specifically, anthocyanin – activity. Choose tart cherries for the highest benefit. Strawberries add sweetness, plus are rich in polyphenols that help regulate blood sugar response, have an amazing combination of phytonutrients: anthocyanins, ellagitannins, flavonols, terpenoids, and phenolic acids, and are Vitamin C standouts. Cashews are added for a delicious creaminess, a bit of protein, and healthy unsaturated fatty acids. These nuts (and though you may read differently on the internet, they are indeed nuts, not legumes) have a high antioxidant content, providing cardio-protective benefits. Oh – and this is delicious! Put all ingredients in a high-speed blender and mix until well blended – top with a frozen strawberry for beautiful color, and enjoy! This is a perfect salad for summer – fruity, delicious, and full of cooling flavor. Experiment with the savory and spicy options for lunch and dinner, and consider the sweeter options for dessert! A bit of attention on the preparation will make a big difference in this recipe – start with a sharp knife! Roll basil leaves together into a “cigar” shape and thinly slice across the “cigar” to make thin basil strips. Then, quarter a red onion, and slice very thinly across the cut side, to make tiny strips of that as well. 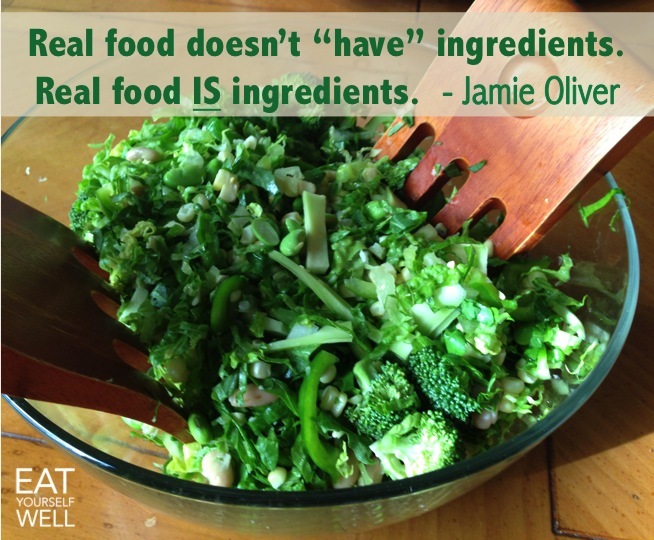 Add everything you are using in a large bowl, toss, adjust seasoning if needed, and serve. 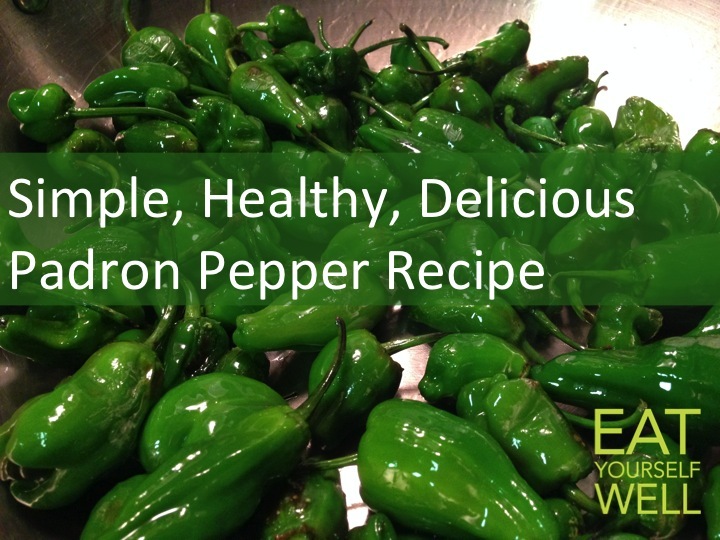 Deliciously simple recipe for Padron Peppers! Not only are Padrón peppers a nutritional powerhouse … but eating Padrón or shishito peppers is also a fun party game. Most are mild, but every now and then you’ll bite into a wickedly hot one (maybe 1/10). Enjoy watching your friends’ faces as they “find” the hot ones! Start with 1 tablespoon oil in a skillet over high heat until just smoking. Add the peppers in a single layer with some room to move (if your skillet is too small, work in batches). Cook, tossing occasionally, until skins are blistered and flesh is softened, about 4-6 minutes. Transfer to a bowl, sprinkle with salt, and toss to coat. If needed, repeat with remaining peppers, adding a bit more oil, and more salt. 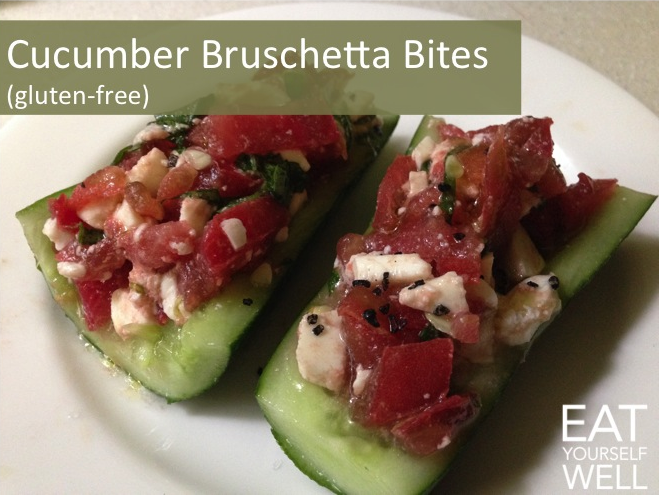 Do you love the taste and crunch of bruschetta, but want to avoid bread? Give this simple recipe a try – you’ll be surprised! Slice the tomatoes and mozzarella cheese into a tiny dice, and place into a bowl. Slice basil leaves into thin strips, and add to the bowl. Sprinkle with olive oil, salt and pepper and set aside. Slice cucumbers in half lengthwise, and again across, to make 4 pieces. Use a spoon to remove the seeds (Do not discard! Add to smoothies, or plant to get MORE cucumbers!) to make a cucumber “boat,’ or slice across the cucumber to make discs. Pile the tomato mixture into the cucumber boats or onto the discs, and serve! When it’s nothing but hot, hot, hot, these simple, refreshing summer drinks – with our without alcohol – are a great way to cool down! 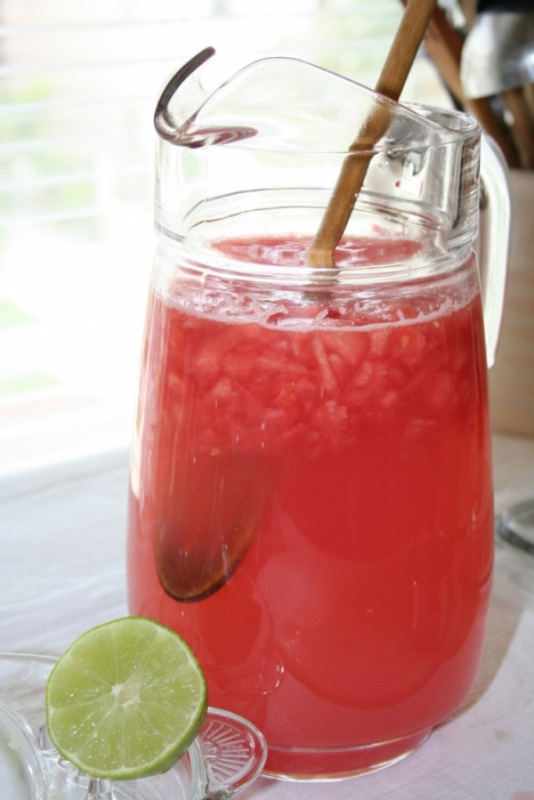 4 cups cubed seeded watermelon – freeze for frozen drinks! Optional garnish ideas – pick one, or get creative: Lime wedges, watermelon wedges (rind on), mint, cayenne pepper, sugar on rim of glass. Frozen Melon Directions: Add first two ingredients to the blender, with 1/4 cup of water and “adult” ingredients, if using. Blend, tamping down as needed, until smooth (do not over-blend, you want this thick and frosty). Serve immediately. Non-Frozen Melon Directions: Add first two ingredients, plus “adult” ingredients, if using, to the blender and blend until smooth. Pour over ice to serve. Enter your email address to receive notifications of new recipes and posts by email. Cantaloupe-Fig Bowl: Savory/Sweet tastes of Summer!